It shouldn't be news to anyone that Hasbro dominates the toy blaster industry. There have been many competitors to the Nerf kingdom, including companies such as Tek-Recon, Buzzbee and Zing. However, a new threat looms beyond the horizon, and it's from an old rival: Mattel. Mattel, a toy company founded in 1945, has been a longstanding icon in the toy community. The toy manufacturer is best known for hit brands such as Barbie, Monster High, Fisher Price, Hotwheels and Matchbox. The California headquartered company recently acquired the Mega Bloks brand to go up against Lego, and are now turning their sights on Hasbro and the toy blaster market. 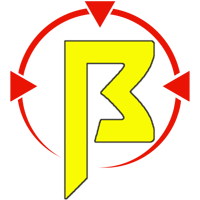 Under the name BOOMco, Mattel is launching a new brand that promises to be every bit as extreme as their blaster making competitors over at Hasbro. Their website, officially launching April 1st, displays young male teens skateboarding, eating some 'za, and engaging in spectacular foam combat inside every child's dream location: a warehouse. Overall, the marketing shows a group of relaxed teens having fun, as opposed to the series tacticool look of Nerf commercials. The blasters themselves don't appear too different than Nerf's own creations. 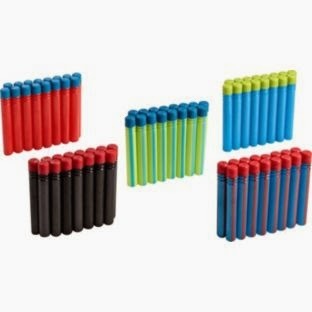 They utilize foam darts with sticky tips to grip onto specialized targets. The videos show the teens attaching their targets on stationary structures as well as each other. 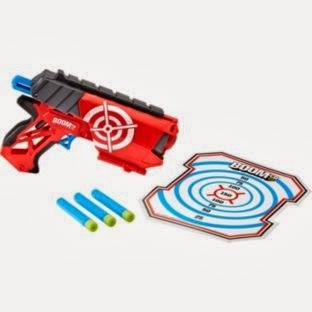 Anyone who follows Nerf might have noticed the lack of Dart Tag blasters and accessories as of late. Could this be an attempt by Mattel to claim this neglected demographic? One hurdle that Mattel faces is pigeonholing their target audience to teen males. Recently Nerf has been targeting multiple audiences, including girls with their Rebelle brand as well as the Humans vs Zombies fans with their Zombie Strike line. The Nerf brand is strong among young males, competing just in that demographic will be an uphill battle. One edge that BOOMco will have over all the current competition is money. Companies like Tek-Recon are much smaller in scale than Hasbro and have had difficulties going blow for blow against the toy giant. Mattel is ranked as a top Fortune 500 company and has access to many resources that can provide useful for competing against Hasbro. If this is anything like the Mega Bloks acquisition, it could serve as the first shots fired in a very expensive war for the blaster market. Ultimately, BOOMco serves to be a threat to a brand that has for a long time dominated the toy blaster space. Competition in any industry is great for consumers, as the brands involved will create better products at possibly cheaper prices. 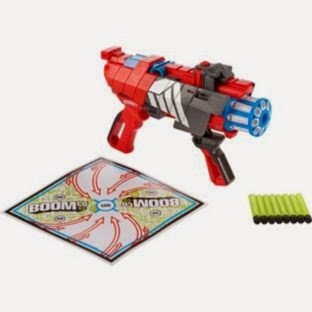 While the science behind the new BOOMco blasters is unkown, I would be surprised to see specs and ranges that aren't at least on par with Nerf. Mattel should understand that with a brand this large, you can't be limping into the pot and hoping to get lucky. What do you think about Mattel competing against Hasbro? Do you think BOOMco has a shot at taking down Nerf? Do you think both brands can coexist, or is it truly Nerf or Nothing? Comment below and let us know! They seem to be blasters that can compete with Nerf on a range and function level rather than visuals or gimmick. So if Mattel are going to compete they're certainly going to try for the long haul, have to say I expect more from such a large company but I think we may see something interesting from them in the future. Seriously, Nerf is traditional, it still would be the prefered between old fans and kids, teens is a bad demographic to aim since they are both more into the coolz, and then Nerf is cooler than these, these seem like, cheap blasters. So to say, and to get this into you, seeing a non-nerf foam blaster, you know it is bad quality, is from a cheaper company, etc., this isnt, but it might fail because habit is habit, Nerf has been around for long, and it is super quality, even if they become more popular than Nerf and I spot someone using one, I will grab my Titan and shoot them in the crotch. medium range.